We like how they’ve kept their subscriber form pretty clean and simple. They ask for a minimum of segmentation info (industry, country, job title). 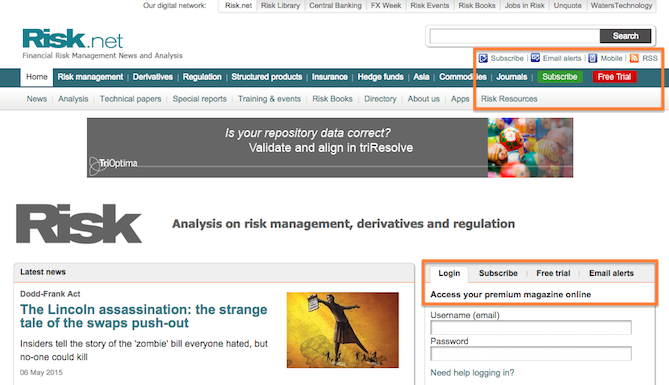 They also make it easy to pick and choose which publications to subscribe to, or to choose them all. The form is easy to understand and it’s quick to fill out. 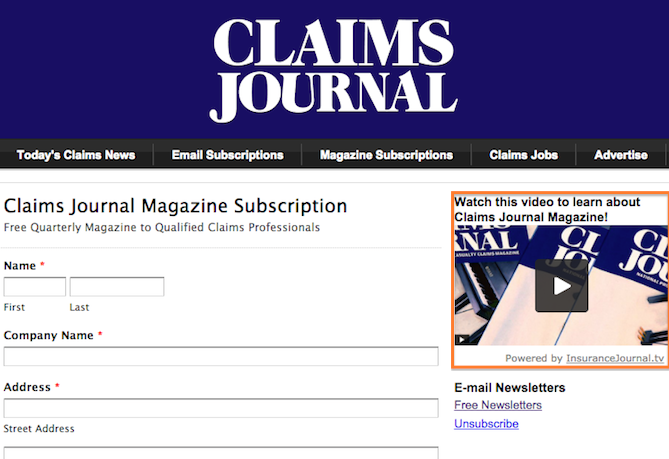 Aimed at insurance professionals that specialize in processing claims, this journal comes out quarterly. 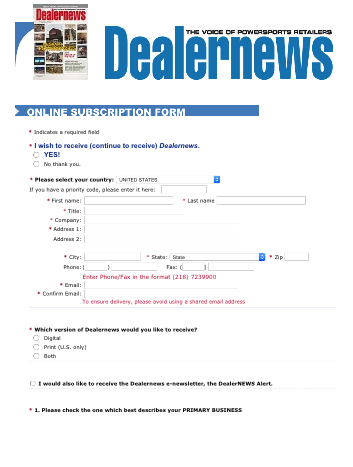 They’ve got a long subscription form, which is typical for a free publication that’s very in-depth. If this is your field, you won’t hesitate to provide the info. We like how open their form is, with easy check boxes for answers. And we especially like how they include a video on the page to explain the publication, its contents and the benefits of subscribing. 1) Clear title at the top, so you know which publication you’re subscribing to. 2) Upfront description of "what's in it for me?" — benefits are clearly spelled out. 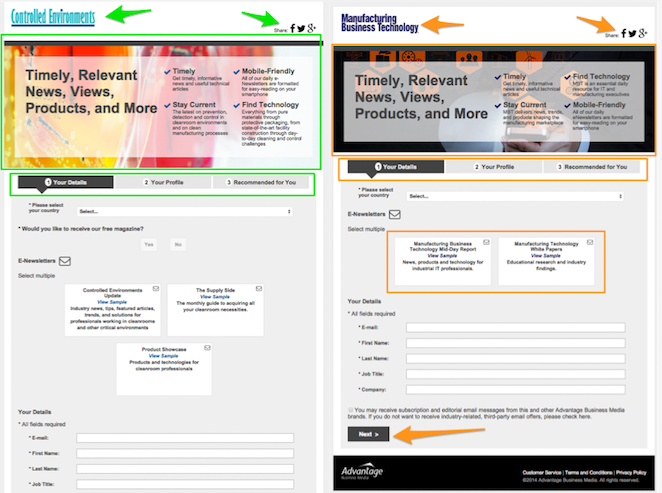 3) There are multiple landing pages with forms as Advantage is asking for a lot of information. But because they’ve it broken into three distinct steps, it doesn’t feel so laborious. You can see exactly which step you’re on, so you don’t get lost. 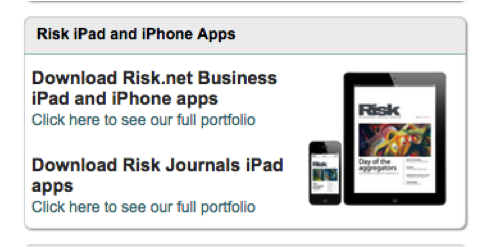 4) You can immediately choose which newsletters you want to receive – the boxes show what their content is. 5) Social sharing buttons are right at the top – so if you think this publication is something your network would be interested in – Advantage makes it dead easy for you to let them know. This magazine is delivered in both print and online editions. Aimed at retailers who sell power sports equipment (think motorcycles, dune buggies, etc. ), we like their page because it offers multiple ways to connect, subscribe, and resolve any subscription issues you might have. It’s clearly laid out and gives explicit instructions. 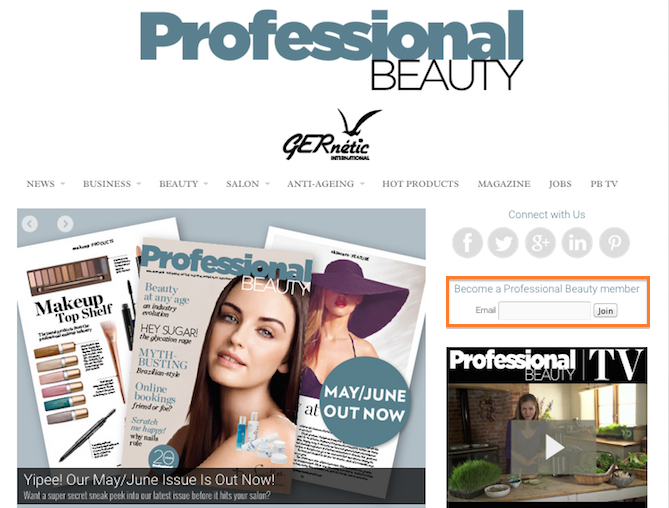 We like the bold headline with the magazine thumbnail – it lets you know which publication you’re subscribing to. Signing up for a new subscription takes a second landing page with a form to collect your data. The questions are clear, answered with simple clicks (multiple choice), and it’s clean, easy to read with lots of white space. What really impressed us was this cool pop-up that appeared when we tried to leave the page without filling everything out. It looks just like a Google alert. Instead of feeling like a pushy sales person trying to get you to do something, it asks to see if you meant to leave the page and politely reminds you to finish filling out the form. Nice save! Aimed at professionals who work with various types of healthcare facilities — from hospitals and clinics to assisted living facilities and hospices. HCFT takes a different approach — it offers memberships instead of subscriptions. 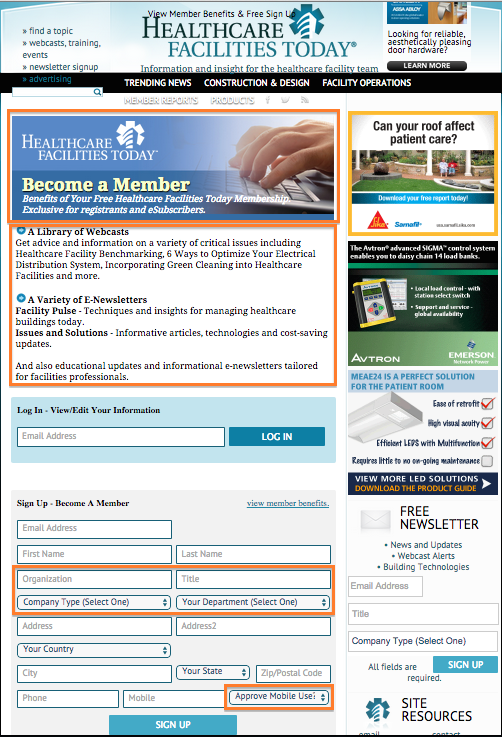 The subscriber page is attractive, and gives you the option of signing on to become a member or get a newsletter. The form is nice and clean, easy to fill out, and asks the bare minimum to help classify you for future contacts. We’re also intrigued because they explicitly ask if you have permission to read on a mobile device. Aimed at the clean technology industry, this publication is hard-core vertical content. If you’re not an engineer, manager, or consultant in the waste water industry, chances are you won’t be browsing through this on a Saturday morning over a cup of coffee. But if you are in this field, you’d find this magazine indispensable. We like how they make good use of white space (easy on the eyes). At the top you can choose what activity you want to do (new, renew, change address, contact). And even though the form looks lengthy, it’s a quick scan and click. 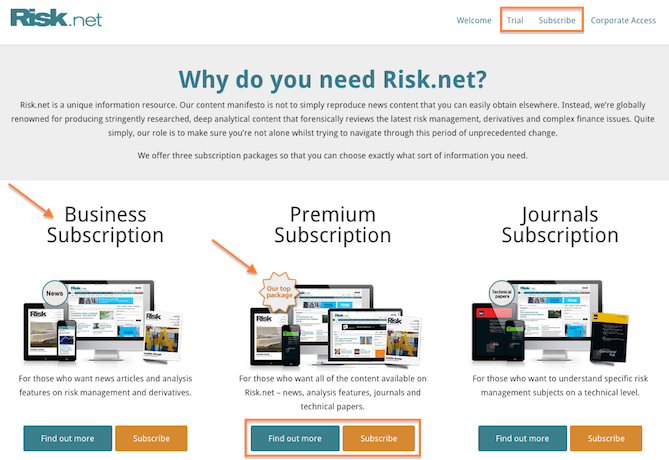 Very well laid out landing page that spells out clear reasons why you’d want to subscribe. Visually attractive with examples of past issue covers and their top stories. 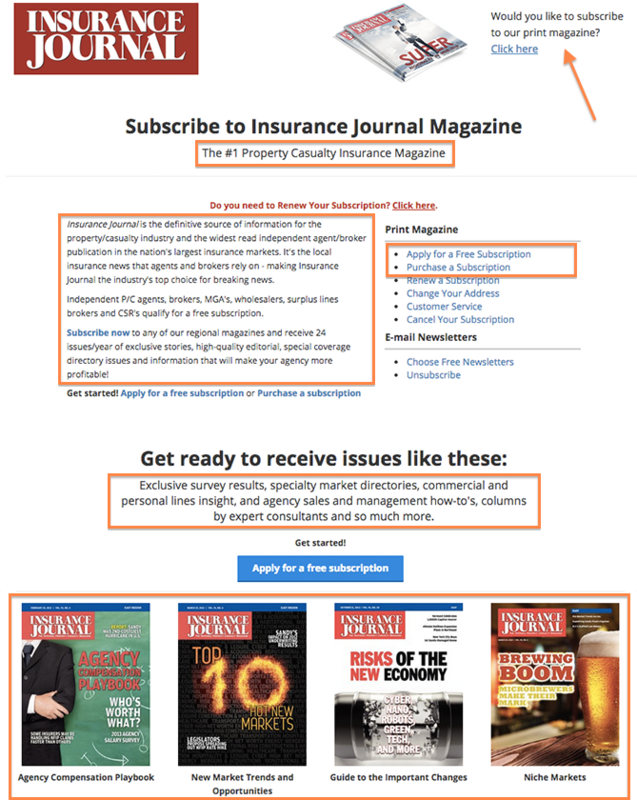 There are several CTAs embedded throughout the page, giving you multiple options to subscribe — pay for the print edition or apply for the free digital one. Plus you can sign up for free newsletters. 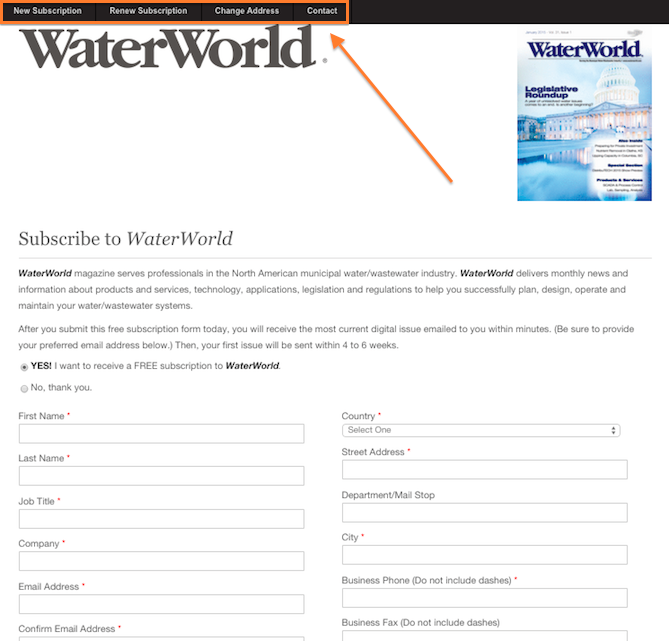 When you click to apply for a free subscription, you’re taken to a form on another page. Although you’re asked a lot of questions, you’re not required to answer all of them. A smart move since a lot of people will abandon a page if you ask for too much information, and ask too soon. Let’s take a look down under at how the Aussies do things. We found this publication targeted at aesthetics industry professionals. Direct, up front, kinda cheeky vibe, very fun. 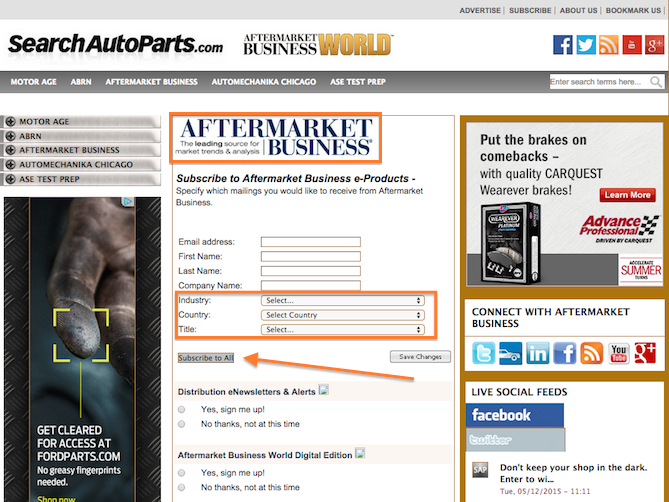 We love how you can subscribe to their newsletter right on the home page with just your email. 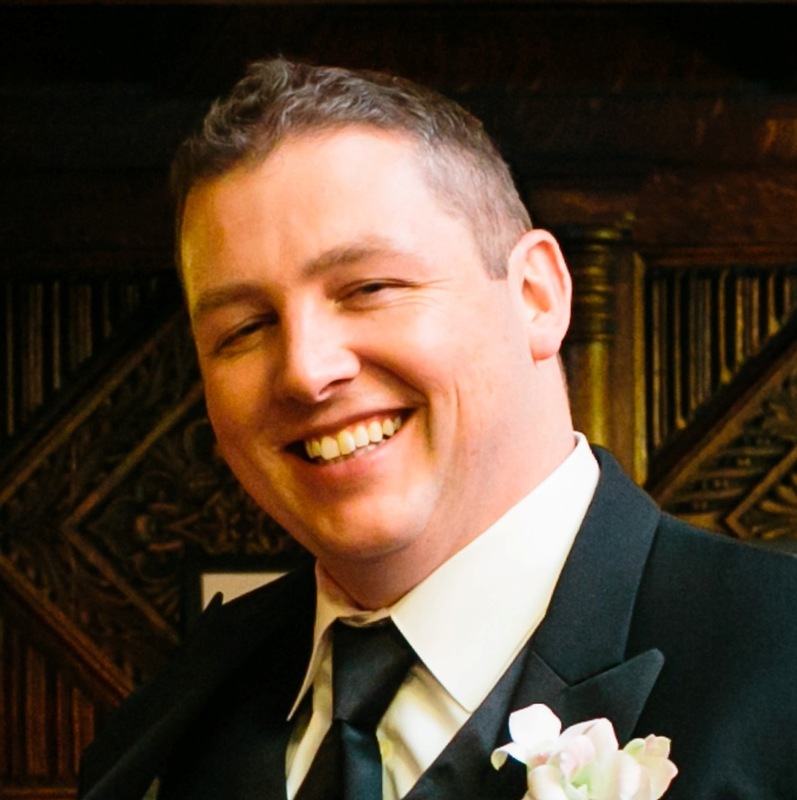 But should you happen to miss that and stumble upon their Free Membership landing page instead, you’re asked the typical demographics questions, plus what area of the industry you specialize in. 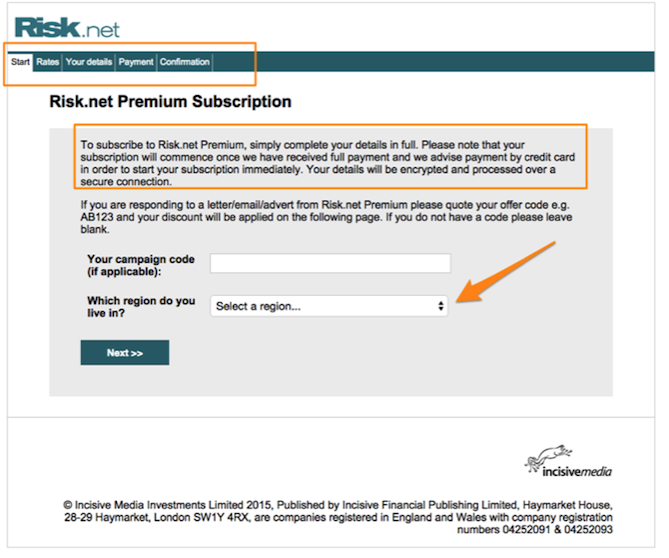 Or, if you want to say heck with all that – you can just sign up for their newsletter. They also make it very easy to follow them on social media – can’t miss it! The form is simple, the subscription page is bare bones on copy, but filled with visual eye candy that catches your attention. How could you not subscribe? Let’s cut across to our cousins over in Great Britain. You normally wouldn’t expect a traditional, “stuffy” industry like a publication in the financial risk management sector to be on the bleeding edge of tech, or marketing, but this publication is pretty cool. Their first subscription landing page is well laid out – and mobile responsive. The landing page is filled with benefits, it gives you three subscription options, points out the most popular one and gives you one last chance to learn more about each option. They even offer a TRIAL subscription! When you click on “subscribe”, you’re taken to the second page where you start to fill out their form. Considering what a pain it is to fill out forms on most mobile devices, this is painless. Each page is short and clear. The forms are easy to fill out. We love how they give you a tab trail at the top so you see which section you’re in and can go back and forth among them, until you get to your payment confirmation. All in all a totally awesome subscription process!